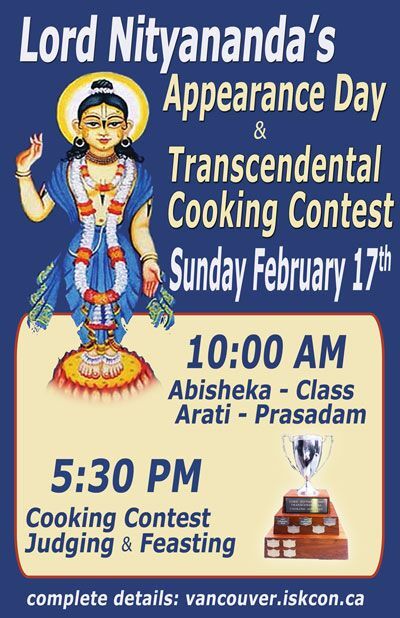 Please note Lord Nityananda's Appearance Day With Annual Transcendental Cooking Competition occurred in past. The purpose of the competition is to please Lord Nityananda! And we can please him by preparing nice prasadam for Him. Lord Nityananda wants our Bhakti, Love, and a practical way we can demonstrate our devotion is to prepare our best offering for His pleasure. For book distribution he encouraged competition. The cowherd boys would also compete with one another to see who could catch Krishna first. Even Lord Caitanya Mahaprabhu when cleaning the Gundica Temple would compete with His devotees. So competing to see who can prepare the best offering for Lord Nityananda on His appearance day is acceptable. It is not just by our cooking ability that we can please Lord Nityananda but by the mood in which we prepare our offering. Indeed if we cook to the best of our ability to please Lord Nityananda with a mood of devotion, He may award us by having our name permanently engraved on His Transcendental Nectar Cup. 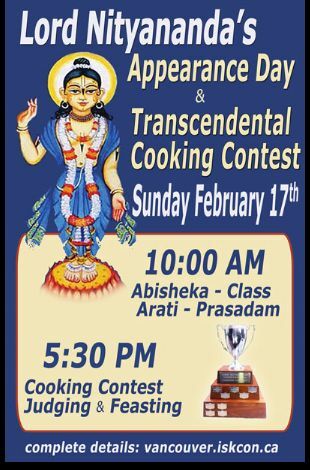 Lord Nityananda's Cooking Contest is a wonderful festival where every devotee can participate by cooking for Lord Nityananda on His special day.